The Gold bugs and Gold experts must be going through hell; almost seven years later and the Gold Bull Market refuses to follow the path these individuals have laid out for it. Proclamation after proclamation has failed, and the detested dollar much to their angst and surprise has continued to trend higher. Inflation has not taken off as they expected; well at least based on the distorted figures the government issues. The masses believe this data is real and that is all that matters in the end. Truth or a lie is based on a perception and perceptions are driven by emotions, which means that everything is up for debate. What holds true today might not hold true tomorrow or what is deemed valid today might be deemed as rubbish tomorrow. The same principle applies to the Gold Bull Market; when the majority embrace this concept, the market will start to run again. Until then it is most likely to remain within a tight trading range of 1100-1280. Throughout 2016, we stated we did not expect much from Gold, and we stuck to this forecast, even though many experts went out of their way to report that Gold was ready to soar to the Moon or even to the next Galaxy. In fact, since 2011, we have continuously said that until the Trend turns positive, it would be best to play other lucrative markets, such as the general equities market, the US dollar, etc. During this time several experts stated that Gold was ready to surge and some issued insane targets ranging from $20,000-$50,000. You would think that experts would try to release targets that made some sense. After all, Gold has not even traded past $2,000, so it makes one wonder how any individuals with a shred of common sense could issue a target of over $5,000. Even this target is quite high, and we only envision it being struck under extreme conditions. It appears nothing has changed and the overall outlook for this Gold Bull Market remains as uncertain as it did in 2014, 2015 and 2016. In January we stated that the Gold market had triggered several bullish signals that should have taken Gold to the 1360 ranges. In any other market, such a confluence of bullish signals would have produced a much stronger effect; the word muted is a kind way to describe Gold’s move to date. However, as the overall trend was still neutral, we also stated we were not ready to fully embrace the Gold markets. It could not even trade past $1300 on a weekly basis; the word pathetic comes to mind when one examines the Gold markets actions over the past few months. It appears that Gold markets are destined to experience more pain before attempting to challenge the $1300 ranges. 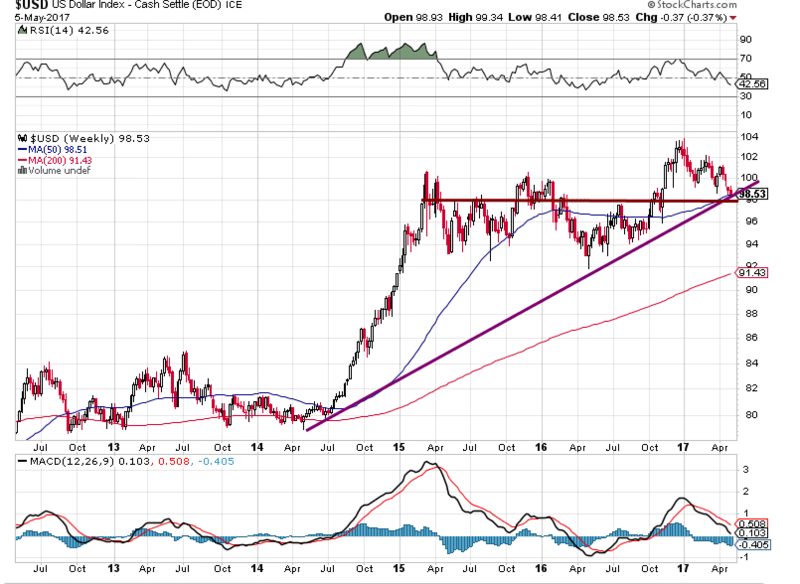 Adding to the misery; the dollars consolidation is drawing to an end, and Gold is now trading in the overbought ranges. The trend is what determines whether we embrace an investment or not. The trend was neutral in back in Jan, and it remains neutral on the long term charts and negative on the short term charts. In other words, the Gold market appears ready to pullback as opposed to breaking out. We will not embrace Gold until the trend changes as there are many other markets out there that make for a better investment. One such example is the biotech sector; however, one needs to tread with caution as this sector is full of speculative plays. For the Gold Bull to resume Gold would need to trade above the main downtrend line. 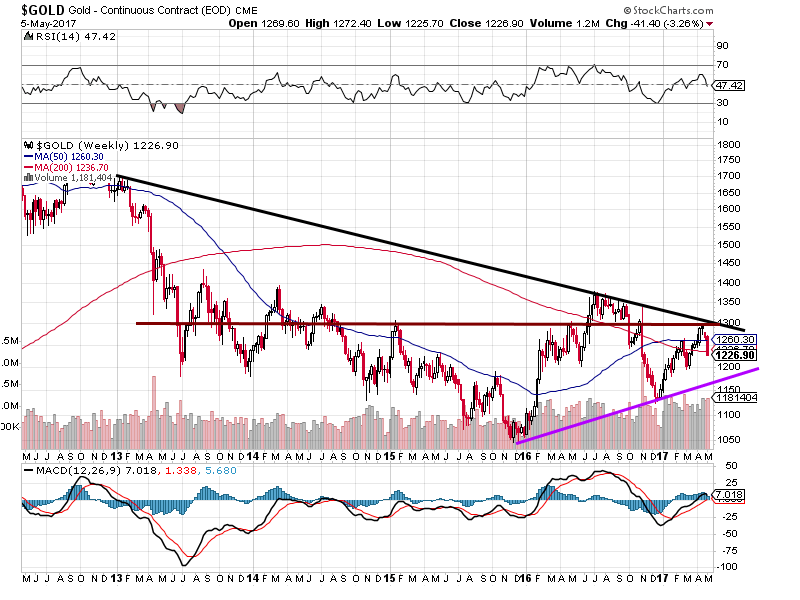 Gold has been unable to do this, and the layer of resistance continues to grow in the $1300-$1350 ranges. The longer it takes a market to trade above a specific zone the stronger the resistance becomes; conversely when it eventually does manage to close above this zone former resistance will turn into support. In the interim, it looks like Gold is headed lower and a weekly close below $1200 could take it as low as $1100. As of Dec 2016, Gold has been putting in higher lows, and as long as this trend is maintained, then the overall long-term outlook will remain neutral. To change the outlook to bullish, Gold needs to close above $1350 on a monthly basis. The Gold standard won’t make a comeback for the next several decades as the current generation does not view Gold as money and has shown no interest in trying to find out the important role this metal played in providing financial stability for the past several centuries. Gold has to be viewed as any other investment; there is a time to buy and hold the investment and a there is a time to close and fold. As Gold could be pulling back; from a long-term perspective, it would not be a bad idea to allocate some money to this metal. The keyword to keep in mind is some and not a lot of money; as we stated earlier, there are many other sectors out there that look more attractive. For example, the biotech sector looks a lot better than Gold and one way to play it would be via the ETF IBB. 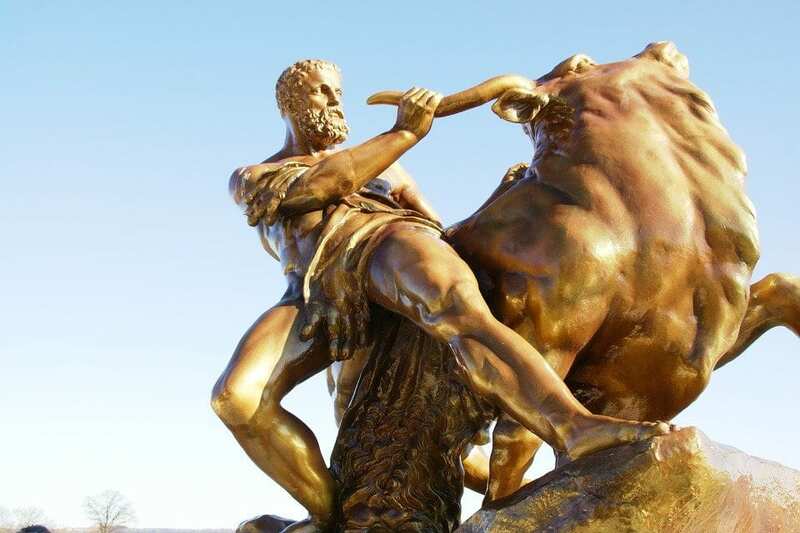 Almost every Bull Market experiences a feeding Frenzy stage; The Gold bull never experienced this stage so from a very long-term perspective, so the odds suggest that the bull market is not dead but in a deep coma. The feeding frenzy is the point that the masses embrace the investment and that usually marks a long-term top in the markets. Oil experienced this stage when it traded past $120 and surged past $140 before collapsing.